Our own central online book database contains over 23 million different ISBNs, and on top of that, uses many online libraries all over the world as fall-back sources. But still, it can happen that your ISBN is not recognized, maybe because your book is very new, or rare, or maybe just never requested by any other Book Collector user before. Add the book to your personal book database anyway. And at the same time help your fellow Book Collector users who own the same book. In the Add Books Automatically screen, after searching for an unrecognized ISBN, a pop up will appear asking you to ‘Submit to Core’. Click Submit to Core and your internet browser will open a new window showing the Core website. Enter your login details, or enter your email address to create a FREE CLZ Account. Fill in the fields provided, if you aren’t sure about a particular field, leave it blank. You can upload front and back cover images too using the ‘Browse’ buttons. Once complete, click Submit Changes at the bottom of the screen. Now when you repeat the ISBN search, the data you submitted will be provided immediately. Alternatively, add the book manually. 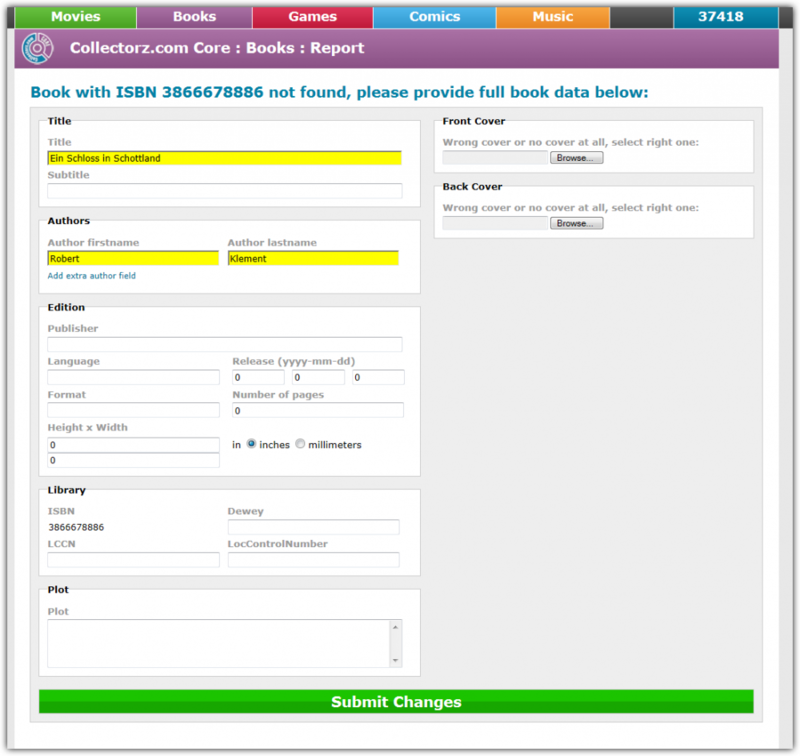 Alternatively, you can just add the book to your local database using the Add Book Manually screen, filling in the book fields manually, then use the Submit to Core feature to send the book data to us. You need to enter the data manually anyway. So why not share your work with others by submitting it to the central online database?